Police investigating the disappearance of a man who went missing after a Christmas party are trying to identify a body found in the River Irwell. 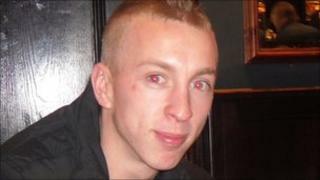 Nathan Tomlinson, 21, of Stockport, was last seen leaving the Mitre Hotel, near Manchester Cathedral, on 17 December. Police believe he asked a bus driver how to get back to Stockport before he was captured on CCTV walking through Salford near the River Irwell. A body was found near Meadow Road in Lower Broughton on Thursday. Greater Manchester Police said Mr Tomlinson's family had been informed and efforts to confirm the identity of the body would be made later. Footage released by police last month shows Mr Tomlinson leaving the bar and jumping over a wall near the cathedral before walking across Victoria Street. He is believed to have ended up in Chapel Street, Salford, where a man fitting his description asked a bus driver how he could get home to Stockport. As part of inquiries to trace Mr Tomlinson, officers carried out a week-long operation in the area around the University of Salford, Peel Park and Salford Crescent railway station.